Visitors to Rambam are politely assisted by a soft-spoken young man with an easy smile. They have no idea of the long path that led Nizar Elkoury, 18, to volunteer at this hospital information desk, giving directions in perfect Hebrew. Nizar was born in Lebanon. His father was a member of the South Lebanon Army (SLA), a Christian, Israeli-backed militia that fought the Hezbollah. When Israel withdrew from Lebanon in 2000, it granted asylum to the militiamen and their families. Given full citizenship and financial help, close to 1,000 of these families settled in Israel. Nazir is one of 30 Sherut Leumi (National Service) minority volunteers at Rambam. Sherut Leumi offers 18-21 year olds who cannot or do not wish to serve in the army, an alternative to military service. Volunteers engage in dozens of “helping” projects. Although largely young Jewish women from religious backgrounds, Sherut Leumi volunteers also include men, and minority members. According to Rambam’s Director of Sherut Leumi, Shlomit Katzir, all qualified and motivated volunteers are welcome. Lubna Kadry, 18, from the Arab Galilean village Nahaf also volunteers at Rambam through Sherut Leumi. Working for the children’s safety organization B’Terem, Lubna teaches children hospitalized at Rambam and their parents about safety in the home. “We work to turn homes into safe havens,” says Lubna. According to Lubna, a disproportionate number of children from the Arab sector are injured in local and household accidents. “Homes and villages are often not safe, and parents are frequently not aware enough about these matters,” says Lubna, who says she is pleased to be helping her people in this way. How in the world can you be so foolish and self defeating, dear Mr. Abbas (Mr. Abu Mazen), to go on record stating that, once you succeed - as you are ceaselessly striving to do - to have the land you are after turned into a Muslim dominated Palestinian state, you will not permit one Israeli man, woman or child to remain living in what once was the very biblical heartland of the Jewish people? Don't you realize that, by making such a stupid remark, you have let all Israelis know - if they didn't already -that you are not really interested in living in true peace with them; that you are only using the so-called peace process to arrive at your "Judenrein" State of Palestine - a state which, by its very anti-Zionist nature, will become a well-placed stepping stone for the entire fanaticized Muslim World from Iran to the Sudan to use to achieve the ultimate goal of most Muslims and Palestinians: the final eradication of the sovereign Jewish democratic state from your midst? What if Israel's prime minister were to announce to the world that the price for a two state solution is that all Arabs now living under the sovereignty of the State of Israel need to leave and be made citizens of your to-be-formed Palestinian state? How would you react, and how would the world react to such an announcement, which would mirror completely the one you just dared make concerning the Jews who now live in their own historic land? With your reprehensible declaration you have foolishly (for you) proclaimed the end of all peace negotiations, even with many among the Israelis who were duped into believing your intentions! Now we know. All you want to use the Europeans (and I am a European) and Americans for is to pressure little Israel into undoing what your Arab friends themselves brought about by their announced wish, as voiced by Abdul Nasser, to drive the Jewish people into the sea. Remember, it was in this war of Israeli self-defense that Jordan lost the so-called 'West Bank'. For many Israelis this land - illegally occupied by Jordan from 1949 to 1967 - was part of their ancestral land. By joining Egypt at the outbreak of the Six Day War (against the appeal of the Israeli government, "please do not do so") Jordan lost the territory to the people who, by divine decree, once owned it. And now you, Mr. Abu Mazan, dare to say that, while the Arabs can live in Jaffa, in Haifa and all over Israel, Israelis who live in their Hebron, in their Shiloh, in their Beth El, in their Samaria cannot live among you - not even one - when it becomes a Palestinian state? From the web site of Israel 21C comes the news of a painless method of injecting medication into the body. If you, dear reader, are anythying like my wife, the sight of a needle creates fear and trepidation. Many of us dread shots, or injections of medication directly into the bloodstream. Those who aren't blessed with "easy-to-access" veins may be subjected to several attempts by medical personnel, some of whom are less skilled - and empathetic - than others. Diabetes sufferers and others who require daily injections may find them difficult to handle, and some people have to administer them themselves. All the above have prompted Israel's TransPharma Medical to spend close to a decade perfecting its unique ViaDerm Drug Delivery System. With a no-fail, painless applicator that never misses its mark, and its pre-measured patches, the ViaDerm system "is ideal for a wide range of medications and treatments," says Dr. Daphna Heffetz, TransPharma's CEO. The genius of the ViaDerm system is in its use of basic principles of diffusion to push medication into the bloodstream. Most injected medications are pushed directly into the bloodstream or under the skin (subcutaneous) via a needle - but it turns out that there is another way to move medication into the bloodstream. Below the outer layers of skin (the epidermis) lies the dermis, which contains elaborate networks of blood capillaries, and comes into direct contact with the epidermis. The ViaDerm system creates micro-channels through the outer layer of skin, allowing the medication to diffuse through them into the dermis and from there to seep into the blood system via the capillaries. The Palestinian leadership is fixated on attempting to press foreign governments and the UN to recognize a unilaterally declared Palestinian state within the "1967 borders." Such borders do not exist and have no basis in history, law, or fact. The only line that ever existed was the 1949 armistice demarcation line, based on the ceasefire lines of the Israeli and Arab armies pending agreement on permanent peace. The 1949 armistice agreements specifically stated that such lines have no political or legal significance and do not prejudice future negotiations on boundaries. From the Israeli website YNET one writer is expressing the views and frustrations with a Europe that seems determined to raise the white flag and surrender its independance, its culture and its social norms. Hello dear continent, for a long time I wanted to write you a few words, as a close neighbor, from here, the Middle East, as one who loves to travel your beautiful landscape, and as one whose parents and roots are planted somewhere across the continent. You were our home for thousands of years, especially the last thousand years. We knew beautiful days of good neighborly relations, cultural and spiritual prosperity, and partnership in out lives on the continent, just as we knew, and how we knew, hard times of hatred, expulsion, degradation, and liable. Somehow we survived. Us, and you. To our sorrow, and to your shame, Our affair with you, dear continent, ended by your choice not ours. We could have lived in good neighborly relations and cooperation for many years, but for reasons you chose to keep for yourself you chose to to end and eliminate this partnership-literally. On your land the plan was hatched, on your land the camps were built, on your land the trains moved, on your land the graves were dug, the blood was flowing into your rivers, and in a short time you cut off a significant Jewish presence of a thousand years. Millions of loyal Jewish citizens were eliminated and expelled from your midst. You eliminated not only their lives, but all their contributions to culture, economics, art, spiritualism, academia, literature, medicine, education, commerce, banking, and life in general. For a long time I wanted to write you, but the opportunity did not come. But this week, after I saw two things-I decided I really must write to you a few words. First, I have seen reports by all kind of experts in the field of demography, sociology, etc., who claim that within a few years, you, Europe, will become a Muslim continent. In some European countries already 50% of births are by Muslims. If we add to this the low rate of birth by non-Muslims Europeans and the immigration data, in not so a distant future-some say in 10-20 years-you, white, and Christian Europe, will become a Muslim continent. It is true that you are trying to somehow fight against this phenomenon-against mosques in Switzerland, against women's veils in France, against immigration, and other minute things, but you also know that this train cannot be stopped. There is a plan to build the world largest Mosque in the center of London, and no one will be able to ban Muslim women from wearing the veil. Liberal enlightened European women, who are permissive, know very well that the day may arrive that radical Islam will gain power and the party will end. Secondly, I also saw the travel warning of many countries warning their inhabitants not to travel to Europe from fear of terrorism. Someone said that it is true that not all terrorists are Muslims, but somehow all terrorists are Muslims. Slowly and gradually, dear continent, you are beginning to understand whom you are dealing with, what kind of religion and culture radical Islam brings. Suddenly you discover what hatred is, the culture of the Shahids of intolerance, lack of openness, what is rejection and alienation of true democracy, human rights, and women's rights. Suddenly, radical Islam is stuck in Europe's throat. Not able to spit it out or swallow. Impossible to spit out because of the political correctness of racism and human rights with all its usual Blah, but it is also impossible for you to swallow, because European culture and Christian liberal democratic white cannot contain such extreme elements of culture and religion. It will end in an explosion. Literally. Dear continent, there is no vacuum in the world. You expelled and killed us, and received instead the Muslim world. In the beginning it was nice and cute, little Mediterranean atmosphere, little oriental sea wind, But with it arrived the storm of radical Islam which threatens to sweep you, our dear neighbor. Now you are beginning to eat what you have cooked. Suddenly, you find women in veils, fanaticism in the eyes and mosques under every tree. Suddenly you find yourself having to contend with birth rate, culture that has extreme features, terrorism and violence which you have nurtured and ignored. You cannot deny these facts much longer. The conflict is here. we, unfortunately, are experts at this, although, we have our own naive and self righteous people. The first time, when the Creator decided to destroy His world because the behavior of His creatures, He agreed to give humanity another chance. He asked Noach to enter the ark to try and establish a new core, and foundation to the world. A core that maybe could produce a more deserving humanity. The ark was the chance of the new world, a shelter for a moment. Will you, dear Europe, be able to prepare for you in advance, a physical, and cultural ark so you can guard yourself and survive? Or aggression, arrogance and hypocrisy will not allow you to admit disaster which you brought on yourself with your own hands, and became a continent who lives on borrowed time? So the fire is finally out and life has to return to normal for those that were affected. The kibbutz of Bet Oren seemed to have an air of normality when we visited it this week, albeit we were there in the early evening and it seemed to be be just as it was before the fire. Of course there were homes that were damaged and those residents are now housed in the Kibbutz Guest House for the time being. However, the wedding hall was functioning as normal and the evening we attended was a great success. On the other hand, not too far away is the artists village of Ein Hod, where damage was much more severe. The village suffered the largest amount of tourism damage of anyone in the vicinity of the fire. They are now using the oportunity to upgrade the tourist facilities in the village and hopefully to attract even more visitors than they have had in the past. 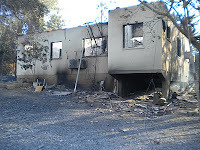 On a positive side the Guest House of Nir Etzion was untouched and once the fire was out, guests returned to this very popular location. The ever in demand Carmel Spa Hotel has had partial damage to its dining room but that is being dealt with and the reports now state that the hotel will be open for business as usual in early January. The children's village of Yemin Orde is facing major rebuilding and I want to use this blog to thank everyone who responded to the cry for help in such a timely way. The annual Holiday of Holidays Festival takes place in Haifa toward through December until Christmas. Whilst the rain disrupted last weekend, hopefully the rain will stay away and winter weather be pleasant enough for this unique outdoor event not to be interrupted for the rest of the month. A month of festivities, cultural activities, performances and events marks the celebration of the three major religious groups that live in mutual harmony, cooperation, tolerance and respect in Haifa. While the Jewish population celebrates Channukah, the Christians are celebrating Christmas and the Moslems are celebrating Eid-al-Adha. The first Mayor of Haifa - Hassan Shukri - initiated the festival in 1914, and since then it has grown in size and popularity. This festival hi-lights the uniqueness of Haifa and its residents. The current Mayor of Haifa - Yona Yahav - describes the event as one "without boundaries of culture and religion". 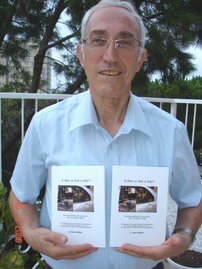 Yahav said in his 2009 official welcome "We residents of Haifa and its many guests have nothing left but to show up and rejoice". The Festival of Festival is held in the Wadi NisNas neighborhood of Haifa, between the Hadar neighborhood and the downtown area. I have been told by a number of people that I have contact with around the world, that they are being bombarded with requests for donations following the fire in the Carmel Forest last week. They have then gone on to ask for my opinion on what I see as the immediate needs. Thus I sorry if I offend anyone if they see this as another way of fund raising, it is not the intention. I have tried to be as objective as possible. Yes, the fire brigades need reforming and equipping for the 21st century, trees will need to be replanted but in our opinion, one of the most pressing needs is that of the Yemin Orde Youth Village which was founded in 1953 to accommodate Holocaust orphans and immigrant children during the great immigration waves of the fifties. Until last week, the village was home to 480 immigrant orphans ages 6 – 19 from around the world. The majority of the children are from Ethiopia, countries of the Former Soviet Union, and Brazil. For many of these children, Yemin Orde is their only home in Israel. The village was severely damaged by a fire that raged in the Carmel Forest. The children and staff were safely evacuated to a sister village, accompanied by psychologists and social workers to help them work through their trauma. As the smoke cleared it became clear that village suffered widespread damage. Three children’s homes were burned to the ground as were 10 staff homes, offices and the library. Other buildings were damaged and the beautiful grounds were reduced to ashes. It is difficult to publish the tragic personal stories of the children and staff, many of whom are graduates of Yemin Orde and whose entire lives were destroyed when their homes burnt down in the Village. Whilst the fire destroyed so much, the spirit of Yemin Orde is alive and the Village will return to be a safe home and warm environment for the children and graduates as soon as possible. Name: Friends of Yemin Orde, Inc. They will process the funds and transfer all the gifts together through UIA in Israel. For a country that is supposed to be "ostracised" according to the minimal efforts of the Boycott, Dvestment and Sanctions movement and the "antics" of the UN, the following summary of assistance sent to Israel to date to deal with the fire seems to paint a different picture. Whilst sitting in a restaurant on Thursday afternoon, we were totally unaware of the drama unfolding in our adjacent national park, The Carmel Forest. Only when we returned home and switched on the TV did we realize the extent of the fire and the tragic loss of life. The bus carrying the young prison officers to the local jail to assist in moving the prisoners to safety got caught up on the narrow road leading up to the jail by the fire that covered 1.1/2 km in 3 minutes. Within a short time, our phone was ringing and ringing and ringing. Friends from the rest of the country and from overseas all wanted to be sure we were alright. Amongst the many phone calls was an ironic one from a good friend in the UK who phoned from his mobile while stuck in snow to see if we were OK. Naturally, our children were concerned and pleaded with us to leave Haifa. However, with an up to minute assessment from the TV, we went to bed and slept well. Our neighborhood is approx 5 km from the action and my wife and I did have a conversation what we should pack into the car if it did become necessary to leave. That is quite a frightening thought, what to take and what to leave. Many around the world face this dilemma where there are hurricanes and tornados but for us this was new and our thoughts were somewhat confused. The following morning, we woke and immediately switched on the TV for the latest news. Not good,the fire was still burning out of control and within a short time the phone was ringing again and this time the grandchildren were pleading with us to leave Haifa. They were concerned that even if the fire was not going to reach us, the smoke and the chemicals in the smoke would be dangerous to our health. After withstanding the torrent of calls, we made the decision to spend the weekend with our daughter in Tel Aviv. We then rushed around packing, cancelled the Saturday night bus we were due to take to Eilat and the Friday night invitation for supper. Did we pack anything special – no. Were we being naïve? I don’t think so. Anyway having loaded up the car we set off south with news that the parallel coast road south was closed as the fire had reached that road. Thus we were left with the main coast road and as we travelled along it we could see part of the extent of the fire. The planes that had arrived overnight were visible, flying out to the Mediterranean to pick up the water and then inland to drop the water on fire. Unmanned drones were directing operations from the air as the ground crew were unable to see the full extent of the blaze and the path it was taking.. So now it is Saturday night, the fire is still raging and the fire crews still have not got the fire under control. We had planned the next few days in Eilat with the whole family and we have decided to go. What will be in the North who knows but life goes on and we can’t drive ourselves crazy. The assistance coming from around the world, particularly the number of firefighters coming from countries like Bulgaria, Greece, Russia, Azerbijan, Rumania, Egypt, Jordan and Turkey is appreciated. This international help is particularly welcome since it is usually Israel responding to other countries disasters around the world and it is good to see that even countries who don’t enjoy the best of relationships with Israel coming to our assistance.